Who’s ready for the weekend? I sure am! I have Marquette Basketball season tickets so on Saturday I will be at the game cheering for them against Ohio State. Go Golden Eagles! I will also be cooking and blogging so you can look forward to some more posts coming up this weekend. 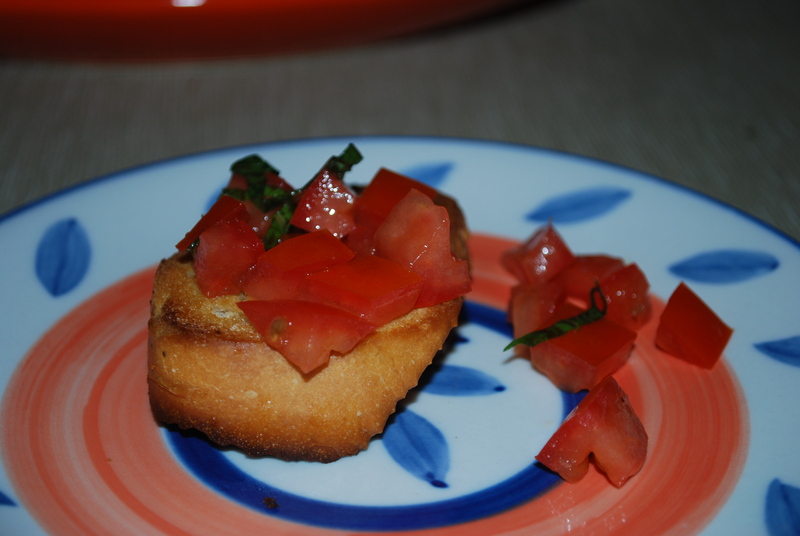 With the holidays on their way, I have a very simple but delicious appetizer recipe for you: Bruschetta with Fresh Tomato and Basil. 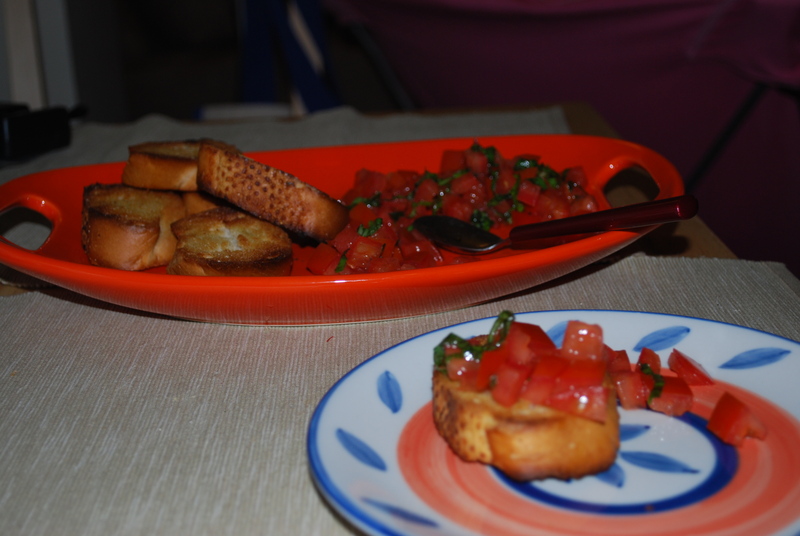 There are lots of bruschetta recipes out there and some of them are extremely complicated. This one is not at all. 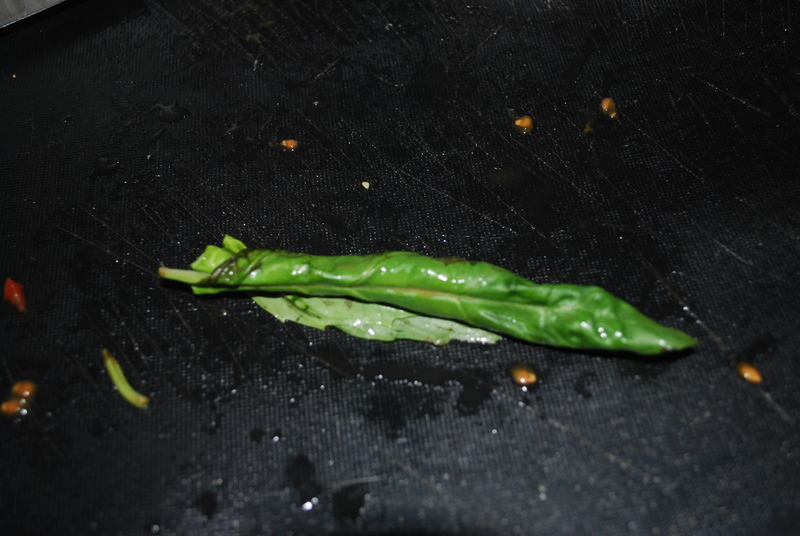 I believe with ingredients this good and fresh, why complicate things? 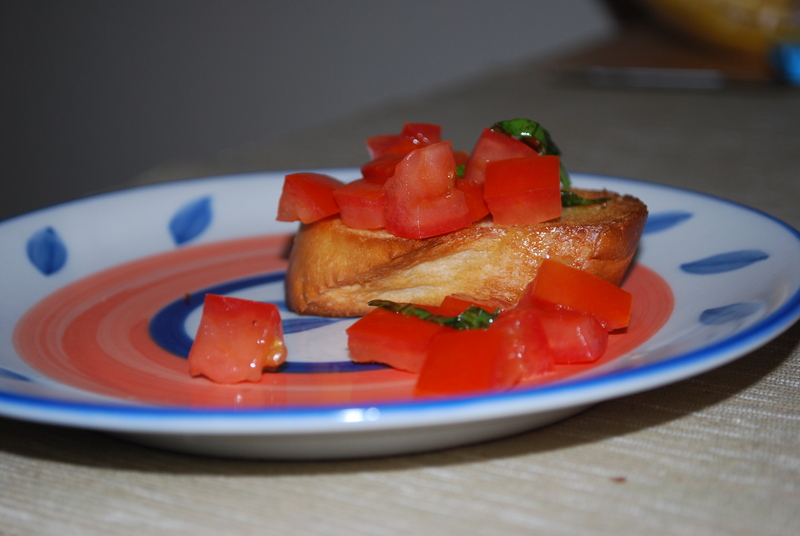 You can make a simple bruschetta that tastes wonderful and fresh and looks just as impressive. First, start with a baguette. 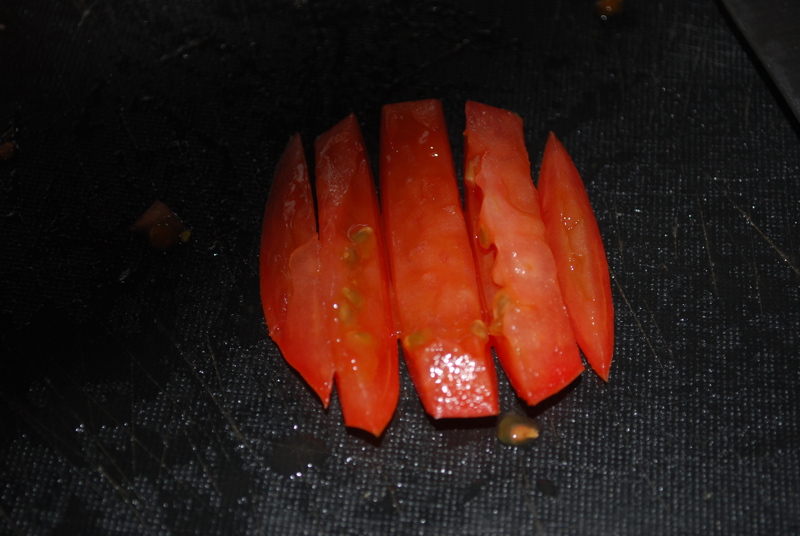 Cut 6 slices. 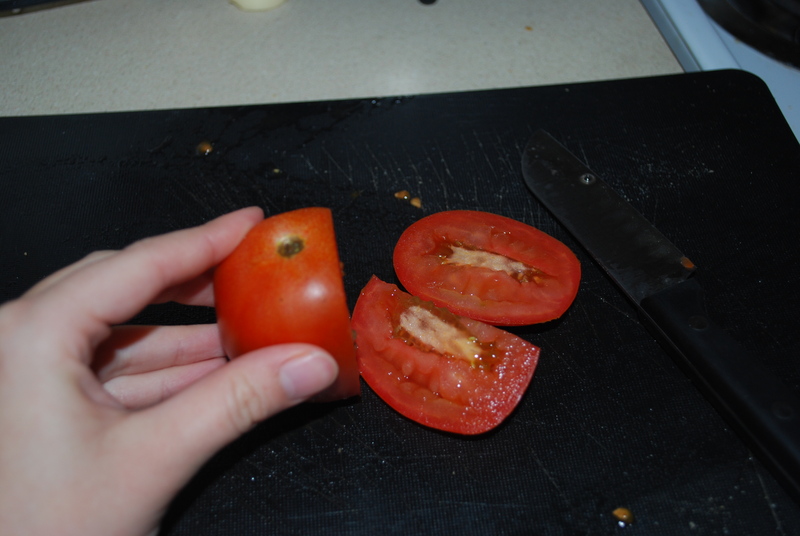 Brush both sides of each slice with olive oil, then place onto a foil-lined baking sheet and broil. 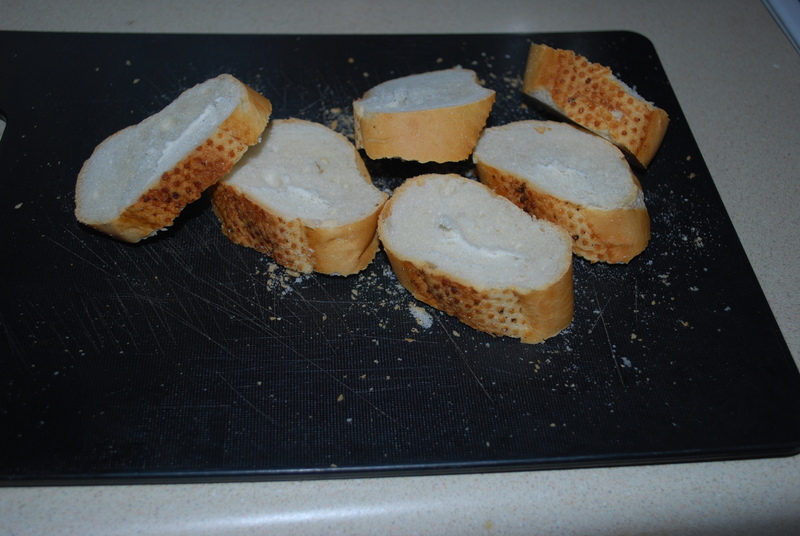 Once one of the sides is charred, flip the bread slices over and brown the other sides. Be careful not to keep them under the broiler too long – they toast very quickly! 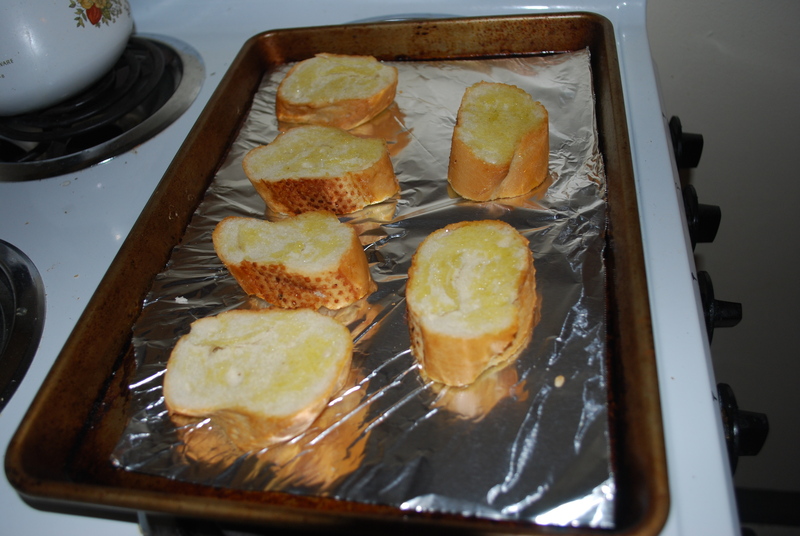 Take them out of the oven, then once they cool a bit, crush a clove of garlic and rub it onto both sides of each toast. A little bit goes a long way! 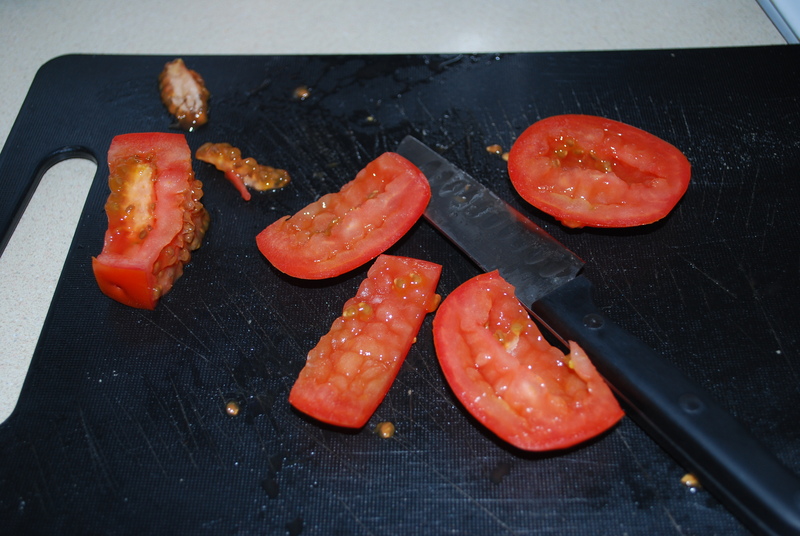 Next, work on the tomatoes. 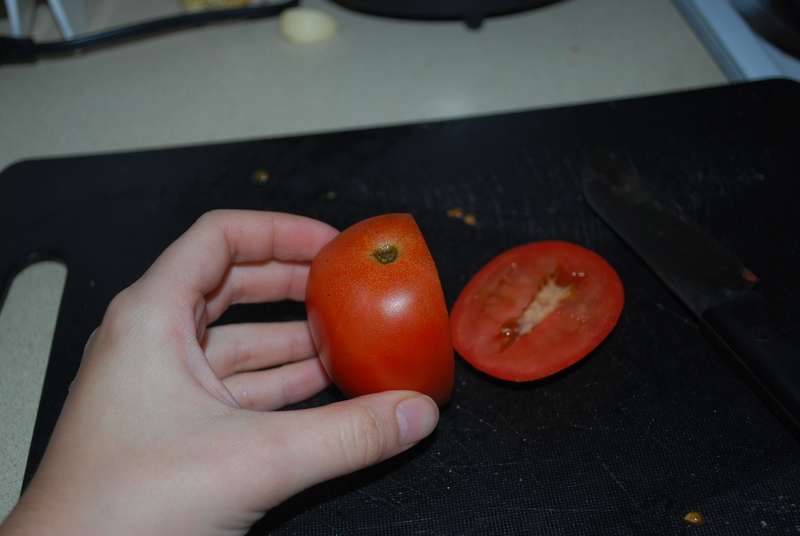 Take 1 of your tomatoes, hold it stem-side up, and slice down one of the sides, cutting the flesh of the tomato away from the seeds. Repeat until all the flesh has been removed from the ball of seeds in the middle. 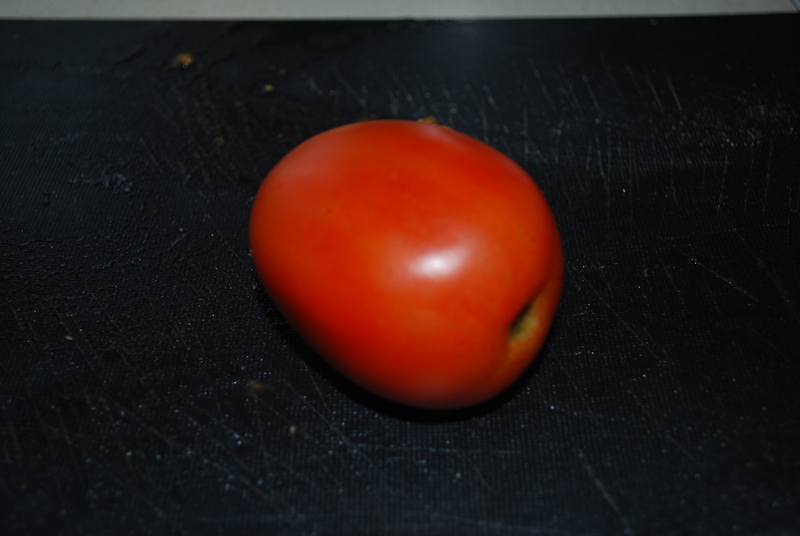 Repeat with the 2nd tomato. 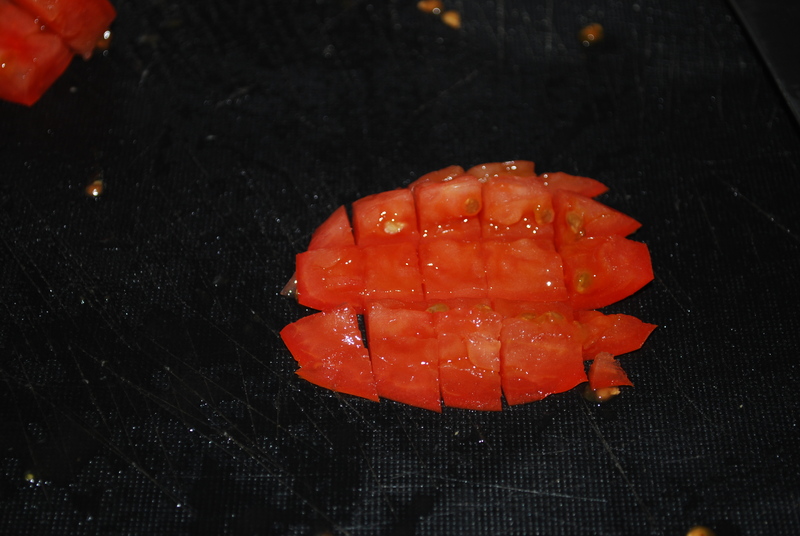 Dice each tomato slice, then place into a bowl. 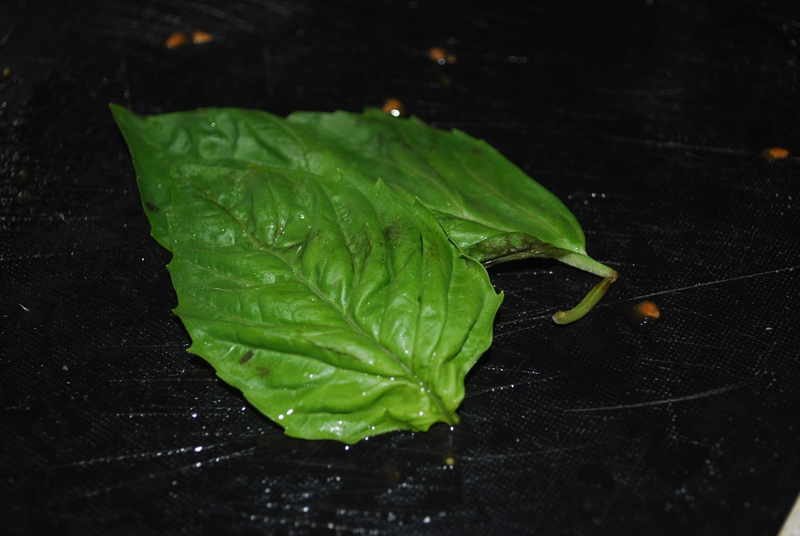 Next, take 3 basil leaves (I only used 2 because one of mine went bad). Stack them on top of each other. 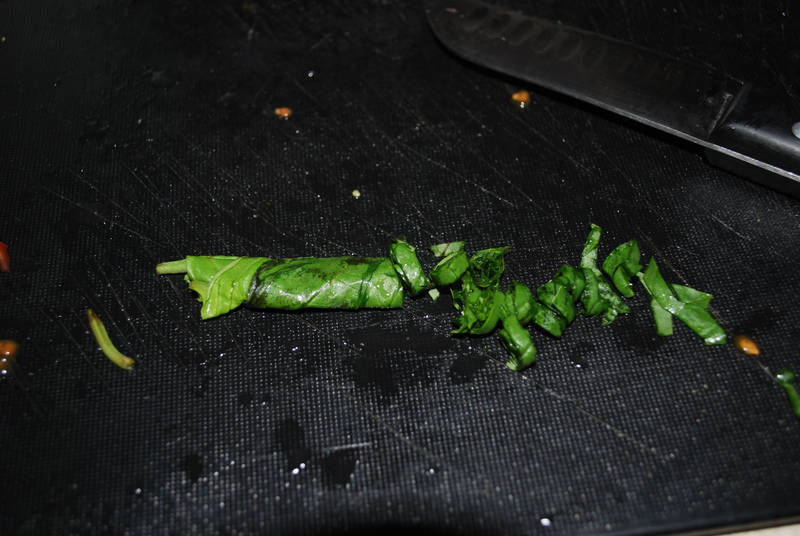 Then roll them into a cigar. Use a sharp knife to thinly slice the cigar. 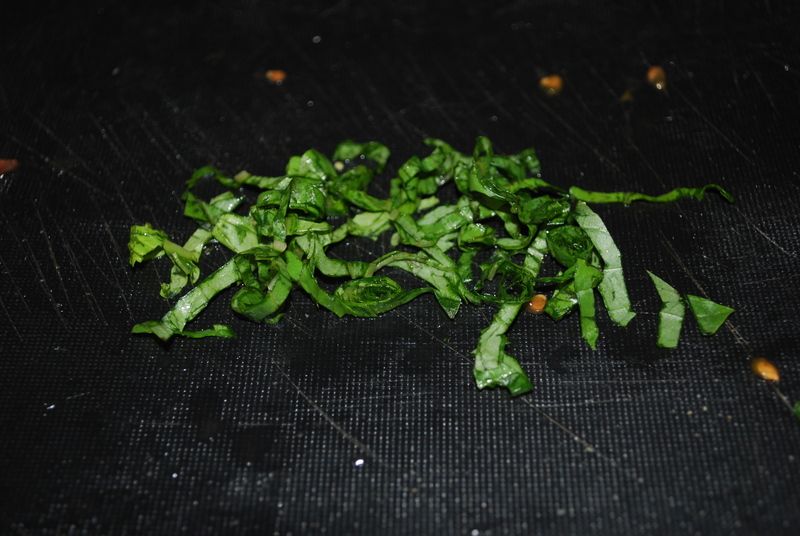 You will end up with thin strips of basil. 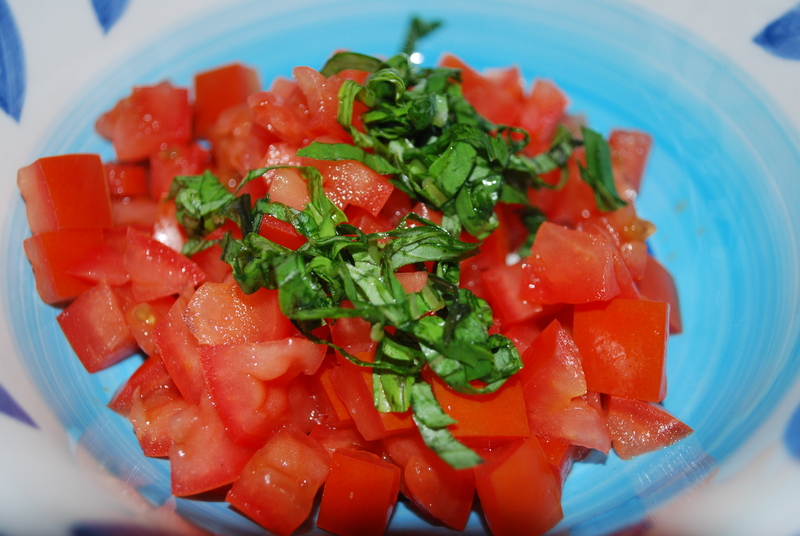 Add the basil to the diced tomatoes, then toss them with some olive oil and a sprinkle of salt. And that is it! 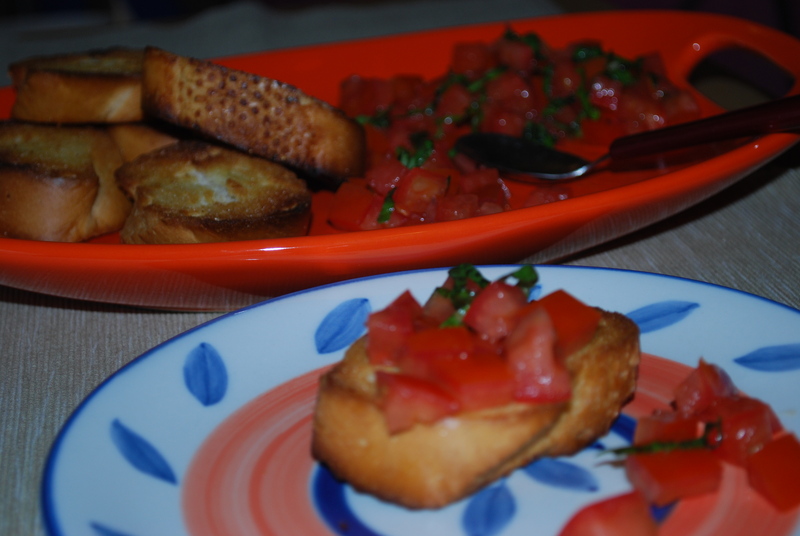 Serve the tomato and basil in a bowl next to the bruschetta and provide a spoon to scoop the topping onto your toasts! Preheat broiler. Slice bread and brush each side with olive oil. 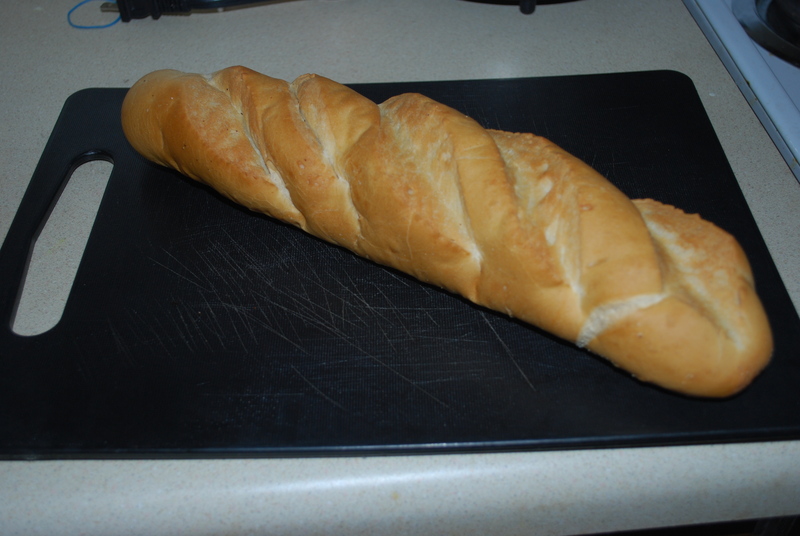 Place bread slices on foil-lined baking sheet. 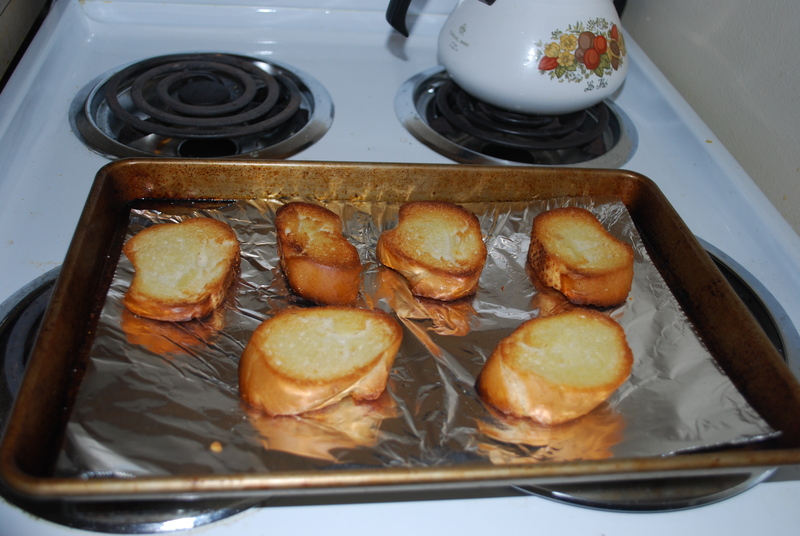 Place baking sheet under broiler and broil until one side is browned, then flip the slices and brown the other sides. Be careful not to burn the bread – it only takes a couple minutes under the broiler! 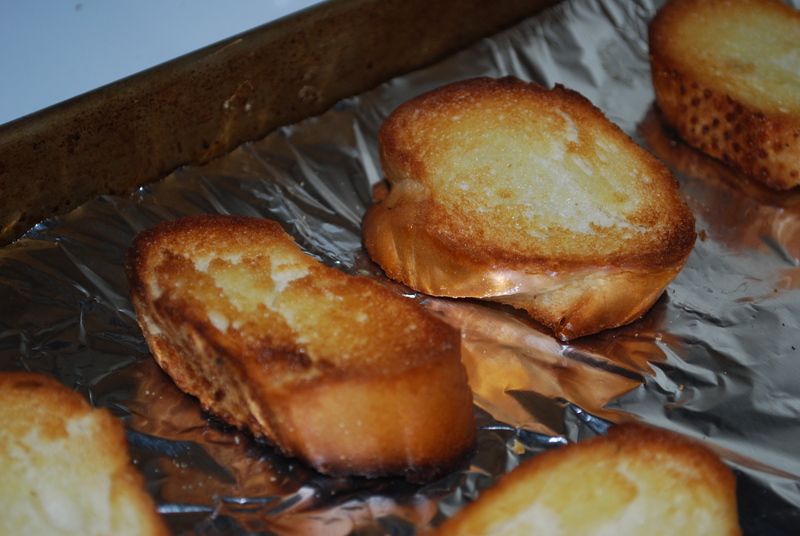 Peel and crush a piece of garlic, then rub each side of the toasts with the piece of garlic. 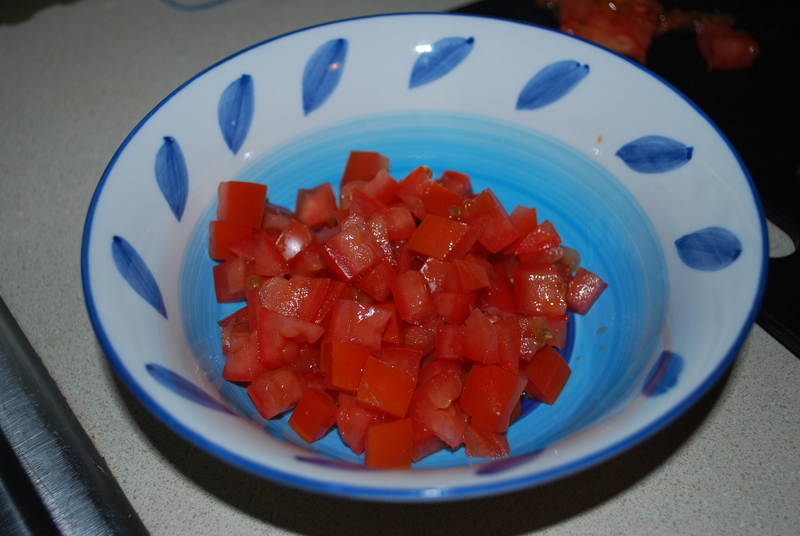 Seed and chop 2 roma tomatoes and place in bowl. 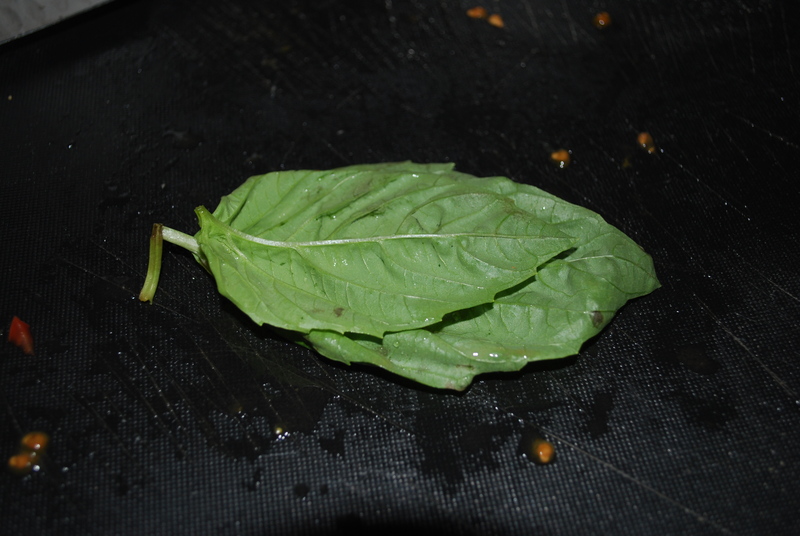 Chiffonade fresh basil by stacking the leaves, rolling them into logs, then thinly chop to create thin strips. 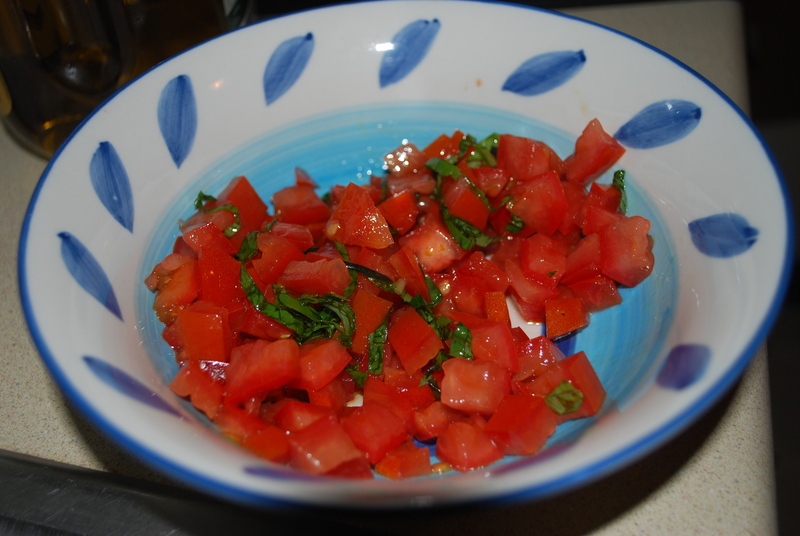 Add the basil to the tomatoes then toss with some olive oil and a sprinkle of salt. 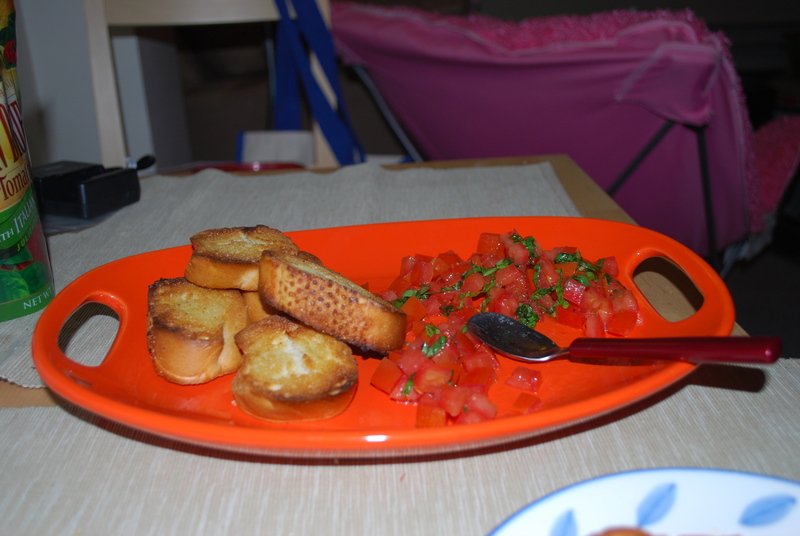 Serve tomato and basil mixture with the toasts. 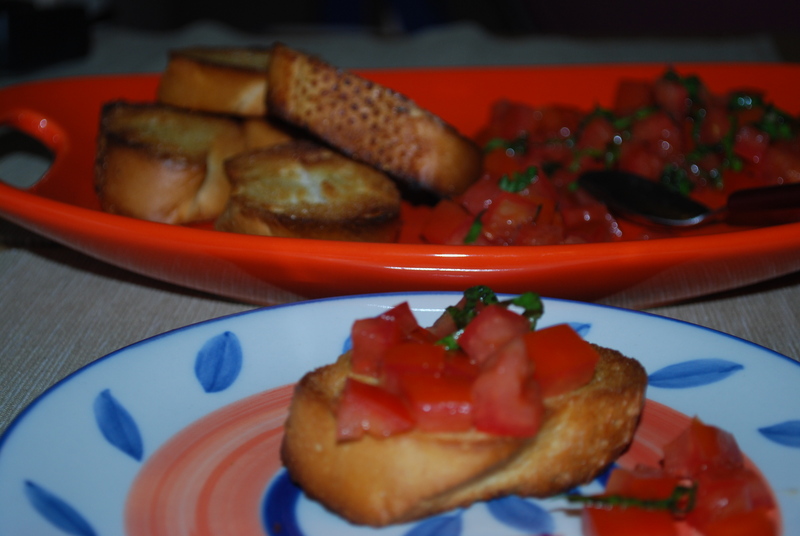 This entry was posted in Appetizers, Dinner, Lunch and tagged basil, bruschetta, easy, fresh, garlic, tomato. Bookmark the permalink.